Looking for a heathy, low-calorie, tasty snack you can make yourself and take anywhere? In this blog, you’ll learn how to make fish jerky over a campfire. Fish jerky just might be the “I’ve never heard of that but I’ll try it” snack you’ll fall for hook, line and sinker. 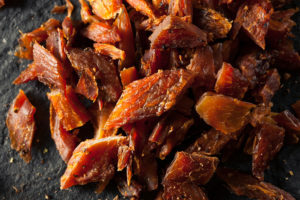 Before the days of refrigeration, jerky helped people bolster their food supplies when the getting was good so they’d have a sure source of nutrition when times were leaner. Jerky has been found in tombs from ancient Egypt, and we know that jerky was a staple of North American and South American native tribes. Jerky makes the perfect fishing or camping snack because it doesn’t need refrigeration, lasts forever, is lightweight, and it doesn’t make a mess (no wrappers to dispose of if you make it yourself, and you don’t end up with bug-attracting crumbs or sticky hands). Plus, it’s low-calorie and low fat, with a ton of good-for-you protein. And, when you’ve had an especially good day fishing, jerky is a great way to use what you catch in a new and interesting way! You can make jerky out of any kind of meat or fish that’s lean. Fat goes rancid quickly, so the less fat you have in your fish or meat, the better. Catfish, for example, is so oily that it doesn’t make a good choice for jerky. Filet – Catch, clean, and filet your fish. Season – Salt, Cajun spice, or soaking in soy sauce are all great ways to inject flavor into your jerky. Plus, any salt you add helps preserve the meat. Dry –Make it right there on your campfire! A smoldering campfire imparts delectable smoky flavor into your jerky. Plus, it looks cool and you’ll feel like a character in a survival movie. You can lay the strips of meat over a grill grate or improvise with long sticks laid horizontally above your fire pit but not close enough so the sticks or meat burn. About 2-3 feet works best. Lay the fish strips over the grate or sticks, it’s ok if they dangle down. If you have a smoker, by all means use it and you’ll end up with a delicious end result. Wait – Expect your jerky to take 4-8 hours to fully dry. We can’t give you an exact time because it will depend on the temperature of your fire and the size or your strips. You’ll need to keep checking on them to see their progress. When the meat is dry but not crispy, and bends but isn’t flaccid, it’s done.